On the top menu within Sentle is a tab called ‘billing’ that contains all the data related to your account subscription, invoices and payments. The first tab selection within the billing area is ‘plan information’ where you will find all the details related to your current subscription plan. As the image above shows at the top of the page you will see details of any due invoices related to your account. If you have an automated payment method set up this will be dealt with by Sentle, otherwise you can select to pay the invoice now via card details you assigned to your account. Your current plan details will display which subscription type you are using, how many users you have assigned and what is included within your plan. The monthly cost of the plans will be displayed here. Sentle neatly displays how many texts, call minutes, file storage or numbers out of your monthly quota you have used in a billing period as shown below. Please note: All unused SMS and Minutes do not roll over into the next month and are reset. If you feel you need to add additional items as a monthly subscription you can do so by choosing from one of the additional subscription items. 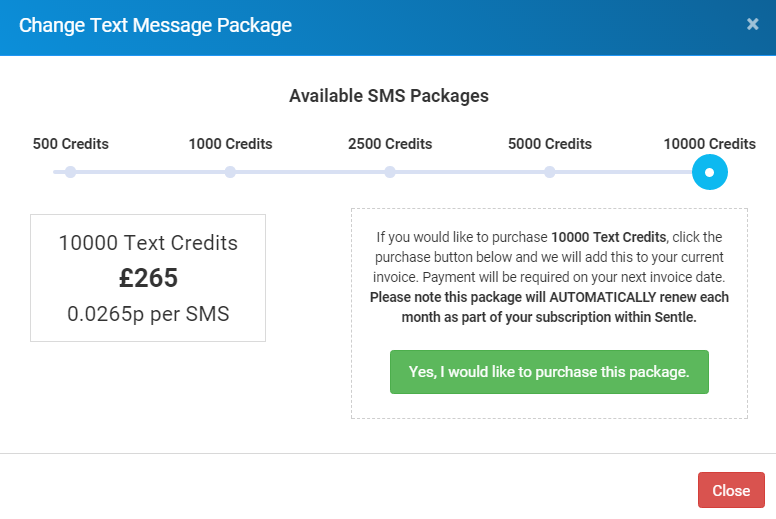 Adding these will increase your monthly quota on top of those items included within your subscription, as per the SMS example below. By using the slider you can determine how many items you wish to apply to your subscription. In this case SMS credits. Once added, this additional product will be applied to your account every month until you decide to cancel or change it. 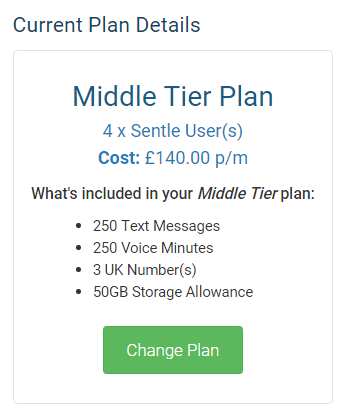 The image above shows the additional message subscription offering 2500 text messages and a cost of £85 p/m in addition to your main subscription. Sentle has been built to be modular to you can cater the number of features you use to suit your business and your budget. If you wish to purchase another module to add to your subscription you can do so by clicking on your module of choice and confirming in the following window. The module will then be added to your subscription and available for your Sentle users to access.